But we do have the ability to change the world. In my world, I’ve never anticipated easy. We’re also trying to change the paradigm. We’re more than just a collection of hammers and saws. It is such an exciting opportunity to really change brains. We always lose touch with common things that everyone uses and where they come from. Welcome to Drexel’s 10,000 Hours Podcast. Our goal is to mine the stories behind our region’s innovators, inventors, and thought creators. We’ll be talking to experts in subjects from fashion to neuroscience to find out where their passion for work and inspiration for ideas comes from. I’m your host, Maurice Baynard. Not that I think that we’re Pinky and the Brain, but we do have the ability to change the world. If anyone can change the world, it’s Veronica Carey. She’s an associate clinical professor in the Behavioral Health Counseling Department in Drexel University’s College of Nursing and Health Professions. She’s been working in Behavioral Health for over 20 years and is currently the Chair of the Academy for Psychiatric Rehabilitation and Recovery. Dr. Veronica Carey. Yes, hello. Welcome to the 10,000 hours podcast. So I’ve been thinking a lot about what our interview– how I was going to start our interview. I want to go all the way back to the beginning. Where did you grow up and was there anything that happened to you as a child that you think informs the adult that you became? It’s funny because you know people do say everything happens for a reason, and you don’t really realize that it becomes 20/20 later on, right? So I’m from Narberth and Narberth is a suburb of Philadelphia. It’s called along the main line. And quite literally, my brother and I, my older brother and I were two years apart we’re the only two persons of color in Narberth Elementary School when we’re both going. I moved there when I was eight. So I was in second grade. He was in fourth grade. And until such time that my younger sister joined us, we were the only two people of color. The idea being that it began to assist me in being comfortable in different arenas. I felt comfortable navigating my home life and understanding, well, when we close the door we may practice this or we may celebrate that. When I go outside to play, people may not understand what I’m celebrating or I don’t understand what they are celebrating. I had a wonderful teacher in second grade. Her name was Mrs. Coffin. And she sort of had this awareness. What an unfortunate name for a really great teacher. I know, but she was wonderful. She was like– I can picture her to this day. And I think about her often actually. But she had this Awareness Day because a lot of individuals, a lot of students had never seen someone of color. Well we were only eight. And if no one was in your neighborhood when would you have ever seen this, right? So we had this Awareness Day where, I’m going to tell you a little yarn. But we took a pencil, and I was able to take my hair and curl my hair around the pencil and pull it out and my curls stayed. Well, you should have seen all the girls in the class, they were like, oh! How did the curl stay? You know, I don’t understand how this could happen. You know, they trying and the pencils are falling to the floor and trying and pencils are falling to the floor. But it was sort of like a celebration for Mrs. Coffin to say, isn’t this great that we have a new student here and her name is Veronica and you can ask her questions and she can ask you questions. But as I grew up in that environment and understood that, wow, this is sort of a celebration, not something of you know, I didn’t understand about difference. I just knew this is great. You know, I can go to my Baptist Church on Sunday and see very similar people. But Monday through Saturday, I’m going to be probably be with more dissimilar people. Of course not having that level of language at that point, but getting very comfortable to navigate both. Then through I went to Lower Marion High School and I jokingly say they don’t know we’re Lower Marion High School is. That’s where Kobe Bryant went. And it’s not where– he went to my high school. Yeah, he went to my high school. I didn’t go to his. And during my senior year I had far too many credits to have to stay on campus. So I knew what I wanted to go into in terms of, I thought I want to major in psychology or sociology. So, the better part of my senior year, I spent at Lower Marion Counseling Services. And I was their front door person. I was the one that greeted all the clients. I greeted some of the patients, depending upon what they were coming in for, kind of like just de-escalate some of their tension, bring them coffee and tea, make sure that they knew I was saying so-and-so has arrived. The next person here for you as the therapist. But in doing so, I realized, wow, no matter who walked in there, I was comfortable with them. So what was it that took you to UDel, how did you choose that? That’s a good question because I did submit, you know a couple of applications to different universities. But as I toured around the campuses, and I had a scholarship to University of Delaware, I thought, well, this is going to be it. This is where I’m going to stay. Right. It wasn’t too far away, but it was far enough that my mom and dad had to call first because why would you want to drive that far and have me not be there. So I had some sort of criteria that I had to meet and one of them was definitely going to be like distance and the comfortability of the campus. And then when I get to my dorm, lo and behold, for three floors, I’m the only one color of three floors in my dorm. Which just made you comfortable. I’m home. I’m definitely home. Absolutely. So what was your major? And what did you want to be? I wanted to graduate. That was my goal. What I want to be in life is graduated from college. A graduate person from undergrad. I want to be a person with a degree. Exactly. Exactly. I didn’t exactly know what I wanted to do with it, to be quite honest. I just knew that I wanted to, I had learned at Lower Marion that I liked systems. I like how things are sort of compiled and constructed. But again, things happen for a reason. I met my husband. What kind of student were you? Well, let’s see. The first quarter or first semester when I met my husband, because I was running around like a loon behind him, I had a 1.8. Horrible, horrible GPA. And I quickly understood, OK.
What did you actually pass to get [INAUDIBLE]? That’s a good question, I should go back and look that up. It was probably something in my major. But, but I mean that’s just horrible. Do you remember what classes you were taking that semester? I remember, well, they were all the gen eds. So they probably bored me half to death. So that’s probably half the problem, right? I probably– because Lower Marion High School is a very, very good high school. So I probably had some of this material before. But I think the majority of it, just to be very transparent was I was just busy running around behind him because our dorms weren’t that far apart. So we could thread across without having to go outside. We could party on both floors without having to go outside, so, yeah. And this is my first time away from my parents and my family. So it was a little bit different. So clearly you turned that around. Oh, yes, yes. What I had to do was, I had French in Lower Marion from fifth grade to 12th grade. So what I did was, I took French, [FRENCH], so what I did was I took French for 100, 101, 102 as if I never had French before to keep getting A’s. So every semester I’d take another French to get another A to keep building up my GPA. And so by the time you graduated, because you did graduate. Congratulations. Congratulations. But you had kind of redeemed yourself. Brought your whole thing all the way back up. Brought it all the way back up. At any time were your parents like on your back, like, you’ve got to do better. Well, this is the great part about it. My parents said, your job is to get in here and get out. We’re not going to traffic you like we did in high school or middle school. So they never saw the 1.8. If you’re going to have a 1.8, the best way to have it is quietly and without parental input. That’s right. But I knew that my job, my parents are two very hardworking people, and who would I be to take their money and sit here and get another 1.8 or 1.3 or whatever or get kicked out. So when I came to that realization, from that point forward I was toeing the line. So I want to switch gears. So you also have huge responsibilities outside the university. So why don’t you tell us about some. Absolutely. So, one of the things is that I am the Chair of the Psychiatric Rehabilitation Association. And in that role what I do is I do both national and international trainings in psychiatric rehabilitation. Most recently, I returned from Abu Dhabi about two weeks ago. And there it was the first Congressional Congress of what’s called the World Association of Psychosocial Rehabilitation. And I was there to present two workshops on the Introduction of Psychiatric Rehabilitation for The New Practitioner. And then what does recovery and relapse mean for those practitioners have more familiarity but probably don’t have the language that they need to educate the workforce about how psychiatric rehabilitation fits. So I wear that hat very proudly. It takes me around the world. I’ve been to Singapore, Korea, Honduras, Milan, Italy, and most notably I’ve been to Pakistan, both Karachi and Lahore. Talk about your work in Pakistan. My work in Pakistan started in 2013. So it started in 2013 and it was with a NGO called Caravan of Life USA and Caravan of Life Pakistan. And who they are is a people to people project, which means that their government does not fund any of this activity. These are all well-intentioned, willing workers, if you will, that are bringing their monies together to make sure that there are behavioral health system is going to be able to generate more recovery oriented practices. Now in the United States we have been doing this for decades, since the late ’60s, early ’70s. So we have a good jump of years that we’ve had history with recovery oriented practices. A lot of our third world and developing countries don’t have this history and don’t want to take that much time to achieve it. So instead, they’re bringing someone like myself to their country to help them implement rehabilitative strategies. And I thoroughly love doing that. Its like what motivates me. Because I’m going to be able to help people that I’ll never meet. So I’m helping practitioners be competent in the field to then turn around and help the individuals that they’re working with. So you have great examples of psych rehab in action, especially in the people that you work with in Pakistan. You want to share one of those with us? Absolutely. I’m glad you asked. Because one of the women we will call her Fatima. She was very, very quiet, a young a young lady, right? So she was early in her diagnosis of schizophrenia. And she has paranoid type. So this young lady, early in her diagnosis was very, very quiet. In Muslim culture, there is a difference in gender, right? So there’s difference in terms of how you approach a male, how you approach a female. So it wasn’t unlike females in Muslim culture to be a little bit more timid and a little bit more reserved. However, there’s a way of viewing it also if it’s going to limit my ability to function. So she wasn’t functioning because of this. She would just sort of sit there and do nothing. So in psychiatric rehabilitation, we believe that people can grow and change beyond the day you meet them. I tell my freshman, if you don’t believe that then this is going to be a hard path for four years and you’re going to have a hard job in life if don’t think the person you’re going to meet can grow and change beyond the day you meet them. So we figure out what makes the most sense to engage that person. So this is my first time in 2013 going to Karachi. I hadn’t learned Urdu enough to really engage people. So I know enough Urdu now that I can get around a little bit. But she also spoke English, which was also great. The more education people have in Karachi, in Pakistan they also speak English. So she was able, she was speaking English. And I would go in and I’d say, good morning, Fatima, and she would stare down at the floor, barely audible. Next day, good morning, Fatima, and she’d do the same thing, barely audible. And then, but the idea being, I was still going to engage her. I was not going to act as if you’re not sitting here because you are. So then after a couple of days of that, I finally went over to her and I bent down. And I said Fatima I’m almost six feet tall. I don’t know how many centimeters or meters or whatever that is, I said. But can you look up when I come by and speak back? Because I can’t hear you when you’re facing down. And then I just walked away as if it was going to happen. And maybe it was later on that day or maybe it was the next day, I could see her registering herself cause she saw me coming. And I thought, wow, she’s really going to do this. But other staff had no anticipation of her doing more than what she was doing. And so she came in she says, Hi, Dr. Carey. And I said, good, morning Fatima. And I kept on going. And the staff were like, are you kidding me? We should be going back there. I said, no, in the quote unquote natural community, no one’s going to celebrate that Fatima said hello. We’re going expect that Fatima said hello. So I just answered her back like anybody else would. When you say hello to me, do I ring a bell and throw balloons and throw my hands up in the air? And staff would be kind of like, well, I guess not. But she– the anticipation is that she’ll– don’t let her digress. Keep doing this. So now other staff are going over and saying, Fatima, if you can speak Dr. Carey, you can speak to me. And she’d smile at them and she’d, OK.
You know, and then we began to graduate, including her into things. Fatima, do you mind if you know, because of course now she’s speaking to more people. Do you mind joining the newsletter group? And do you mind being the one that circulates the newsletter since you’re greeting people? It really helps to say good morning and hand over the newsletter in the different parts of the building. Of course, she was, OK. You know and she’d walk real slowly and she’d get the newsletters in the morning. And I said, don’t forget. I’m going to be down the hallway. I should be able to hear your greeting. And she’s OK.
And, good morning. Next day, I’d say, could you please say good morning to the person’s name? That’s really helpful. It makes them feel happy and included, Fatima. Good morning, Maurice. And she’d him the newsletters. OK. So we’d continue to do those kinds of things, right? Because everything in psychiatric rehabilitation has meaning. We just don’t put you know pegs in holes and that kind of thing and say, OK, we’ve done something throughout the day. So that process had meaning for her, right? She was now included. She had a task. She had a role. As adults, we have many roles. You engaged me earlier today, asking me how many hats do I have, which I could say synonymously with how many roles do I offer in the community. So age appropriately, we’re now giving her a role. And she was in charge of disseminating those newsletters. Well, every weekend, she would go home to family members, pretty much getting into the vehicle, one of the aides would walk her to the car, female to female, and get her into the vehicle and they would drive off. This particular Friday, I remember it was a Friday because that’s when her parents came to pick her up, the aide went. Fatima got into the car and all of a sudden I saw the aide like flailing her arms. And I thought, oh my gosh, Fatima fell underneath the car or fell off the curb or what happened? And the aide came back into the building. And the programs called the recovery house, and she said, you should have seen Fatima. She was talking about everything she’s been doing and how much responsibility. she has and next week she’s going to be doing. And I didn’t even know she wanted to do that next week. And the family started crying because they’ve never heard her speak so much. And then the staff. I said, now we can celebrate. And the staff were hugging each other and high fiving each other. And that’s what psychiatric rehabilitation looks like. It’s those small things that happen, where you can see where the point started and where the point is at and see what that differential is. And it reinforces me, Maurice, time and time again to continue to generate a workforce so that people that I’ll never ever meet in the countries that I land in and educate in and leave will have these kinds of outcomes. So what do people not understand about psych rehab? They don’t know how to distinguish it from psychology, and oftentimes can’t distinguish it from psychiatry. So psychiatric rehabilitation is a recovery oriented strategy based on several evidence-based practices that demonstrate people can have what’s called recovery in behavioral health. Now recovery doesn’t mean absence of the illness. Recovery means I can live, learn, work, and socialize. I can function with the least amount of direct practitioner intervention. So this is why I tell clinical medical practitioners to do your job and do them well because you’re going to generate people who are more stable and for longer tenures of time than recent behavioral health history. A lot of new pharmacology has afforded people longer tenures in stability than ever before. And that, coupled with good therapeutic interventions and a recovery oriented model, now we have people that have schizophrenia that are living learning, working, and socializing. We have people with PTSD that are doing the same, bipolar disorder. So it’s a different orientation. It’s almost as if someone has cancer or diabetes or heart condition. We don’t expect them not to live, learn, work, and socialize. We expect them to do so, but maybe at a slower rate or maybe with a limited assistance. Or maybe with checking into different kinds of professionals. And that’s what the recovery oriented strategy now means in behavioral health. And that’s what psychiatric rehabilitation talks about. Right, if we just buy everybody a Coke, everything be good. Right? OK, so here’s my question to you. So given your psychiatric rehabilitation lens, what is it that you would like to teach the entire world or give the entire world that they don’t know? I would like to have the entire world realize that even when someone has a quote unquote disorder, that they’re still capable of something and that we shouldn’t view it as a disability. Because really, by definition people want to be able, and by diagnosis, they may be disable. But we call it a label. And we say they have a disability. And when I’m teaching my freshmen through my senior students, I will correct their language from freshman year to senior. And I say, if you’re using words like someone suffering from schizophrenia or suffering from bipolar disorder, well, then, doggone it, I must be really suffering if you’re using the word. I must really be disabled, right? But instead, what I teach my students is that the diagnosis made you eligible to meet that person. After you’ve met them, who else are they? Taking us back to when I was running programs, Maurice, I used to literally reinforce my staff by giving them a day off with pay if you can come and tell me the multiple hats the people you work with wear, not that they have schizophrenia, bipolar disorder, whatever it happens to be. Who else are they? And how are you going to find out who else are they? You have to do what? You have to talk to them. So now I’m paying you to engage people. The diagnosis made them eligible to come into our program. Who else are they? And you should have seen staff collecting these great lists. Maybe they’re a father. Maybe they’re a brother. Maybe they’re a son. Maybe they’re a missionary for their church. Maybe they volunteer in the football field. You whatever, they happen to do they bring these to our staff meetings and they would literally come in with them close to the vest because they didn’t want someone else to steal an item off their list that may be you know parallel to someone else or working with. And it was almost like that typical, you have a business card, you kind of go, bam! They would just bring their list, and lay them out and be like drop the microphone. There you go. Day off. Day off. Boom. Seven things. You know, and I’m like, wow! But the idea wasn’t just to find the seven things out. You’re going to talk to people. Now when they come to a program, you can say, I’m so glad you’re working on your coping skills. I’m so glad you’re working on how to introduce yourself. I’m sure you can practice that at church or on the field or in that, you see, it’s beyond the doors of the service. So that’s what I want people to understand. People are going to have something that may be very situational, and by definition it’s very independent and unique. So the situation could be months long, could be years long. But if the work force believes that change can happen, and it has. So as a collection as a collective of professionals, then we’ll see change that much sooner, hopefully then reducing the stigma. Dr. Veronica Carey, it’s been a real pleasure getting to know you. 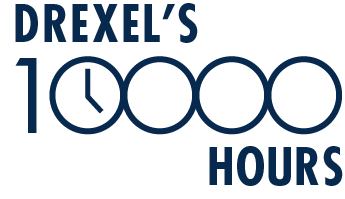 The 10,000 hours podcast is powered by Drexel University online.